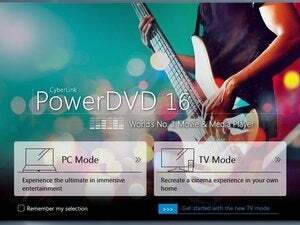 CyberLink’s PowerDVD has long been a powerful media player. The $100 (as of March 8, 2012) PowerDVD 12 Ultra continues the tradition, establishing itself as the Blu-ray/DVD/music/video player to beat. It makes movies look great and audio sound wonderful, and it's entirely tweakable. Even better, the easy-to-use program plays a ton of file types, including 3D video and photos. Version 12 takes PowerDVD further toward being a truly universal media player and organizer--but it has also developed into a large and resource-hungry application. The core reason for buying PowerDVD is its Blu-ray movie playback. In that regard, version 12 has only one new feature: TrueTheater 3D, which turns 2D movies into 3D (sort of). Previously you could use this feature on DVD movies; now, you can apply it to Blu-ray playback as well. PowerDVD's other new features all pertain to organization, streaming media, mobile devices, and social media. The revised interface is logical, with a left-side navigating pane that lets you easily switch between functions as well as navigate the music, photo, and video libraries. A large pane to the right displays the actual data. Functionally the interface is much like iTunes, but it's styled in dark gray and black tones--not particularly warm and friendly. Also, navigating the program's media library and moving between areas was somewhat slow in the version I tested (12.0.1312.54). The software can now function as a DLNA server as well as a client. You can use it to stream the multimedia content on your PC across a network to other devices, as well as play content from other servers. CyberLink has produced new two-way media streaming/syncing apps (version 4) for both the IOS and Android platforms. The apps are free for PowerDVD Ultra users, but cost $5 for users of the less-expensive PowerDVD Professional and Standard. The company also offers a free app to turn your mobile device into a remote control for PowerDVD, a handy feature that worked remarkably well on my iPod Touch. In addition, PowerDVD 12 integrates browsing and playing YouTube videos, freeing you from having to open a browser to do so. Facebook and Flickr are baked in, too, but although I was able to upload photos, PowerDVD didn't seem to recognize any of the nearly 100 pictures I already have on Facebook. 7digital music store access is now available, so you can shop for and download tunes; you can participate in CyberLink's MoovieLive cinema database and community site as well. I did find one minor bug in the music player: It listed an Apple lossless file by the wrong name, and then would not play it (apparently lossless .M4A files are not supported). On the other hand, applying the TrueTheater audio effects breathes new life into old tunes. If the software only had something along the lines of Windows Media Player's SRS TruBass to give them more kick, I might switch to PowerDVD as my main music application. Other useful new features include support for lossless pass-through of Dolby TrueHD (7.1), DTS-HD Master Audio (7.1), Ogg, and Flac formats. The downside of all the new technology CyberLink has added to PowerDVD is that it requires a lot of resources. After installation, I counted nine separate PowerDVD-related programs running (most in the background), consuming close to 500MB of memory. Unfortunately, the software doesn't seem to provide a way to turn off features that you might not need, such as DLNA serving, to free up system resources. Actual playback performance was top-notch. A true all-in-one media application is something that many users would appreciate and possibly spend $100 for. In its twelfth incarnation, PowerDVD comes close, and if another iteration were to add TV support--and scale back its hunger for memory and CPU cycles--that package might just fill the bill. For now, buy PowerDVD for Blu-ray playback, which it does very well. You might opt for the $80 Professional version that handles Blu-ray but omits some of the streaming features and support for the 7.1 audio codecs. The $50 Standard version is a good player, but lacks Blu-ray support, which makes it hardly more useful than the free Windows Media Player or VLC.